Top Kids is an evangelistic and teaching programme that reaches children in the slum area of Tungsonghong in northern Bangkok. Every Saturday the children are loved and have fun as they learn about moral living and the Bible. The “Through the Bible" curriculum, written and illustrated by Prasert Taksin and her team, is used to lay a foundation to present the gospel. After the lesson, the children receive a meal they eat together. Around 80 children have been converted and are being discipled through this programme. Children who make a commitment to Christ are encouraged to study a Bible correspondence course (THA01a), and a number of older children who have come through the Top Kids programme stay on as leaders. The effects of the programme are felt in the wider community too, as Prasert and others visit the families of the children involved during the week to spend time and minister to their needs. 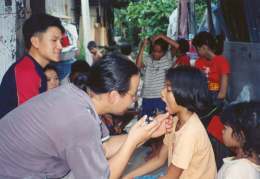 The Heart of Mercy project is another of the ministries of the Muangtong Mission Centre, working under the oversight of World Outreach Thailand, which provides support for children and families living in slum areas in north Bangkok. Housing, sanitation and the basics of life are often in short supply as families struggle with the many problems affecting the urban poor. Where employment exists it is often poorly paid menial or factory work and the families are often transient, putting a heavy burden on the children especially. Thai schools require that children have the school uniform in order to attend class, and commonly one school has several different uniforms. Heart of Mercy commonly provides a uniform and stationery to poor children, allowing them to have access to basic education. Heart of Mercy also steps in to assist in crisis situations, whether it is providing transport to hospital or food for those not able to afford it or in times of disaster, such as the 2011 flooding which inundated the poor communities around where Top Kids is located. In 1978 two women from New Zealand went to Thailand and started the Good News Team. They believed the way to impact the nation for Christ was to establish a ministry sharing the Good News with the Buddhist children throughout the nation. Bright Hope World has now partnered with them for a number of years, providing financial assistance so this work can continue to grow and reach out to more Thai children. Children living in the slums of north Bangkok who benefit from the opportunity of going to school through the Heart of Mercy project and then also get the additional tutoring and spiritual input on Saturday with Top Kids. The leadership team of this project have such an awesome love for children and a real desire to transform whole communities in Thailand by reaching out to the children. The commitment and dedication of the team is inspiring and we are excited about the potential here to raise up many young men and women for God. 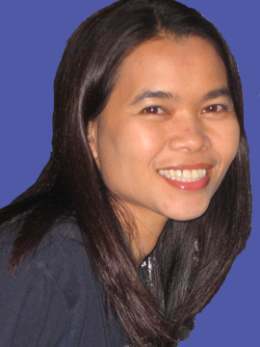 Prasert Taksin is a Thai from Northern Thailand who came to Bangkok and was trained by Lorraine Dierck, one of the two missionaries from New Zealand, following graduating from Bible School in 1990. Together they planted a church in the northern suburbs of Bangkok which was the only church amongst 500,000 people. Prasert heads up both the Top Kids programme and the Heart of Mercy ministry. She has a special anointing to share God's love with children and has led hundreds of children to Christ. She is the founder and co-director of the Top Kids and Heart of Mercy programmes. 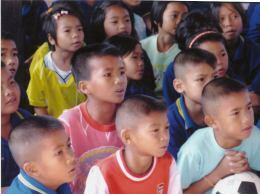 20 million Thai children and youth have not yet heard a meaningful presentation of the gospel. Thai youth are the key to the future of the church in Thailand yet at the same time thousands of them are being exploited and abused. They desperately need to hear that God loves them and can give them a new life in Jesus Christ. Top Kids and Heart of Mercy seek to get alongside many of these children, show them God's love, care for them and teach them. Pooky is 13 years old and has been coming to Top Kids since she was six. She became a follower of Jesus when she was nine years old. Following Pooky's conversion, her school teacher was very angry when she refused to pay homage or worship the Buddha image during prayers at school. The teacher threatened her with expulsion and forced her to clean toilets whenever she refused to join the Buddhist worship rituals. In 2006 Pooky asked Prasert if she could be baptised in water. She said "Even if everyone in my school is Buddhist, I have decided to follow Jesus Christ with my whole heart". On the day she was baptised her Buddhist mother felt God's love touch her heart and on that day she gave her life to Christ. Both mother and daughter constantly encourage one another to remain faithful to Jesus Christ. Mim is eight years old and has been attending Top Kids for two years. Her mum left when she was young. She lived by herself during the day while her dad worked. When a Good News Team member first met her, she was very dirty and infested with lice. She didn't go to school because kids would pick on her because of her appearance. After some hygiene skills and basic school skills at Top Kids, she now attends school, has moved out of the slum, and is very happy with a great heart for God. Miw began coming to the Top Kids programme in January 2007. She enjoyed the programme very much and invited her three sisters. Her eldest sister May became a Christian in July. Her mother, Mrs Chin, was so amazed at the change in her daughter that she began attending Muangtong Church and three weeks later she gave her life to Jesus Christ.